The above picture is what the Holographic Medical Pods look like which the Secret Space Programs (SSP) utilize in their medical bays. Source: Ileana the Star Traveler, former Secret Space Program Asset on Mars. Writer’s Note: Med Bed technology has been “suppressed” and hidden from the public for a long, long time. Fortunately, due to the planetary shift from 3D to 5D happening at this time, and the increasing demand for transparency by the human collective consciousness, an increasing number of courageous people are coming forward to disclose what they know has been hidden for decades, even centuries, and most likely for thousands of years. Two of these courageous souls are Ileana the Star Traveler (her internet name) and Jared Rand. Ileana wrote the information on the Holographic Medical Pods from her personal experiences as a Secret Space Program Asset on Mars. Her information is posted in the second-half of this article. Jared is a highly intelligent and knowledgeable man who has been working with the global transition for decades, and has information about many topics the general public is not aware of, including but not limited to, off-world ET technology gifts to humanity like the Quantum Financial Computer System, Anti-Gravity Propulsion, Replicators and Med Beds. Jared says his family has been in the U.S. since 1624 – long before it became the United States in 1776. Do the math and that’s 394 years (2018). He even gives us a clue to cross-reference his identity and family if we are so inclined to take the trouble to discover it. He says to look up Charlestown, a suburb of Boston, Massachusetts. There’s a cemetery in the town (actually there is more than one), and on the main lock of the cemetery gate is the name of John Rand. Research reveals there was a John Rand, Sr. that lived in Charlestown, Massachusetts Bay Colony, British Colonial America from 1664-1737. Thomas Rand, whose family was from Essex, England lived in the colony about 1626–1683. Charlestown is a historic waterfront neighborhood originally settled by a group of Puritans. The settlement increased in size to about 20,000 people during what’s known as the Great Migration from 1620 to 1640. They came in family groups rather than as isolated individuals and were motivated chiefly by a quest for freedom to practice their Puritan religion. Charlestown is the oldest neighborhood in Boston, incorporated as a town in 1628, and incorporated as a city in 1847. Charlestown Peninsula was the site of the first key Revolutionary War battle – the Battle of Bunker Hill (now The Bunker Hill Monument) on June 17, 1775. Jared talks about high-profile issues impacting humanity’s 3D-5D transition (aka The Great Awakening into Unity Consciousness, Ascension, The Great Shift, The Event), considered to be the greatest evolutionary event in human history. He says his mission is benevolent: to help educate the general public about what has been hidden from them, who and what we really are, and where we are going. Jared also hosts a daily global guided meditation program that starts 3 p.m. Eastern Standard Time (EST) in the U.S. Telephone numbers to access the “live” program for callers in the U.S. and International countries can be obtained at the meditation’s website. For more information, check the listing in the Resources section at the end of this article. The initial goal is to reach 8000 people meditating on a consistent basis. It is said that one person with focused intent can effect change for up to 1 million people! According to Rand, there are three (3) types of Med Beds: (1) Holographic Med Beds; (2) Regenerative Med Beds which regenerates tissue and body parts, that’s powered by a different source; (3) Re-atomization Med Beds that in about two-and-half to three minutes will regenerate the whole human body, head to toe. What does this advanced technology mean for an 80-year old woman? She could be 30-years old again in less than three (3) minutes. Fifty years pealed off her life. Now, she can have children again. She could have a whole new family if she wants. It looks like to this writer that the Med Bed technology is a perpetual fountain of youth. The Med Bed looks at the body and corrects imperfections. The technology has been around for quite some time. It’s not something out of the clear blue sky. It’s just been kept hidden from the human race for a very long time. The technology of the Med Beds is not from planet Earth. It is not human-created technology. It is a technology that has been given to humanity by off-world ET’s. A Med Bed is based on tachyon particle energy and plasma (plasmatic) energy. The soil, the atmosphere, the water, everything is plasma energy, everything in the universe is plasma energy, it’s just a different form through vibrational frequency. The Med Beds have Artificial Intelligence (AI) that’s controllable so it cannot get out of control and run wild. The AI is the computer. It operates kind of like an MRI, where you sit in a tube and it rolls over your body and does a magnetic oscillation and resonance scan of your body to diagnose disease. The Med Bed scans your skin, your muscle tissue, all the organs and everything in your body. It shows everything – all the way down to the micron level of the blood. It actually identifies your DNA and it does a complete internal analysis of the body. When it does that, it picks up any disease and any genetic imperfection. For example, you could have stage 4 leukemia, and on a Med Bed in about 2.5 minutes, you’re cured. No side effects. And, if you had an organ cut out or removed from the body, the Med Bed’s re-atomization process regenerates that organ as if it was never removed. Because your body leaves a resonance – a vibrational frequency. The body always remembers when an organ has been removed or stopped operating, and the Med Bed’s artificial intelligence links into the body’s vibrational frequency and DNA to regenerate the organ. Rand says he has studied cancer research for many, many years. Cancer can be cured with the Med Beds all day long; very easily and very cheaply, too, he says. Because he’s done it for people. With the Med Beds, cancer is gone. Chemotherapy becomes obsolete. Lou Gehrig’s disease, Hodgkin’s disease, Muscular Dystrophy, all disease is gone, eliminated. Rand says some people believe this whole process of healing with the Med Beds is just science fiction. That it can’t be true. Somebody just made it up! And, because nobody believes it exists, its easy to manufacture them in quantity and get them ready for distribution. “When you are in this Med Bed, you don’t go through any pain, you don’t go through radiations. It’s not like some evil event. You go into a deep sleep. There’s no injection, no needles or anything. You wake up and look in the mirror and your creepy skin is gone. Your white hair is the color it was when you were in your twenties (20s). It’s the same for your eyesight, your hearing, your taste, your smell. Everything is restored to a perfected younger state again,” Rand says. “This is the new age for the new Earth and new human race. It’s totally the opposite of what we’ve lived. These technologies are already here. It’s a matter of getting them safely – SAFELY – to the people that can use them. ”In the article on this website, “Behind the Scenes News Sources,” on the update for July 15, 2018, Saint Germain says Med Beds will be introduced to the public before the end of 2018. Ileana the Star Traveler wrote the following information on the Holographic Medical Pods. She obtained the information by using a unique method “hypnosis regression memories” whereby Ileana was able to verify the information did indeed come from the Secret Space Program by seeing the holographic medical pods during her tenure as a Secret Space Program Asset on Mars. The information is available in a PDF free download – see Resources at the end of this article. Ileana hosts the Awakening Cosmic Reality Show on YouTube – an interview program covering topics such as spirituality, ET contact, healing modalities, awakening and the ascension process. She has published many fascinating stories of her galactic travels at her website, and also channels benevolent star nation beings, spiritual guides, and her Higher Self. She has the ability to astral travel, conduct remote viewing, and work in the Akashic Records. She has obtained much knowledge from her past lives as a star traveler living out in space. The following information contained in Ileana’s PDF reveals how the medical pods work, what they look like, and how they are utilized in the advanced medical field of technology with 3D anatomical imaging equipment. Information is also provided on how the medical pods can revive people from the dead, cure diseases, heal wounds, remove scarring tissue, and administer an age regression protocol before discharge from the Secret Space Programs. The Holographic Medical Pods are automated medical stations where a medical expert selects the type of medical procedure to be done from the computer database, then the patient lies down in the pod, and the machine performs the medical operation or procedure, then the lasers will close up the points of entry where the procedure was done. These types of holographic medical pods have features such as an Airtight Operating Shield, Comfortable Limb Restraints, a Laser Scalpel, Laser Mirror Arms to remove scarring, Computer Controlled Robotic Surgical Arms, Liquid Spray Anesthetic, Vital Signs Sensors, and all of these features are mounted on an Adjustable Titanium Base. The Med Pods (aka Med Beds) allow users to diagnose, treat, and preform a wide range of surgical procedures with the ultra-fine laser incisions that are guided by 3D anatomical scanning. The 3D scanning has refractory lenses which take live scans of the body in order to do various medical procedures. The 3D anatomical scanning lens and laser technology allows for complete diagnoses of all body systems including neurological factors, treatment of infections through concentrated antibiotic injections, detoxification of the body in order to cure diseases like cancer, basic or advanced wound repair, limb regeneration through cellular DNA reconstruction, and scar removal. As well as other procedures can be done such as appendectomy, laparoscopic ablation, and Cesarean section. The Med Pods can also regenerate dying cell tissues in the body in order to make the cells healthy again, as well as revive neurons, protons, stem cells, etc. This is done in order to be able to cure diseases like for example Multiple Sclerosis, Alzheimer’s, etc. The advanced medical pods have micro laser technology and multiple refractory lenses that can manipulate the body’s natural chronometer and perform age regression procedures through DNA modification or even do cross hybridization between human DNA and ET genetics, or mix animal DNA with the human genome to create stronger and healthier species of humans. There is advanced holographic super computer software that can create various types of memory engrams that can be imprinted on people’s brains through light spectrum visual imagery in order to create false or altered screen memories. As well as brain memory suppression injection drugs are administered so black listed classified memories cannot be easily recalled by individuals. These procedures are often done in the SSP programs while someone is being treated in the Holographic Medical Pod before their contract discharge time is up and they are administered the age regression protocol. Interactive super computer software display that can encode memory engrams onto the brain during the age regression protocol process. Some of the Med Pods have bio-mimetic gel on them which will synthesize healthy and young cell tissue in the body in order to replace the cells that are dying off and can no longer self regenerate. The bio-mimetic gel is also use to prevent third degree burns from scarring the body so that scar tissue does not build up on the skin. This gel also removes any germs or bacteria that can cause infections in the human body. (Left Picture) This is an example of how the Bio-Mimetic gel is placed on one of the Holographic Medical Pod units. (Right Picture) A Medical bay being prepared for 3D metric laser surgery with one of the Holographic Medical Pods. Medical Lab for Holographic Medical Pods: The Holographic Medical Pods are usually located in medical lab bays either on space stations, planetary bases, or on space ships. These Med Pods can be installed virtually anywhere as they do not require much power to operate. There are also portable Meditech Pod units which put injured subjects into stasis sleep in order to slow down bodily degradation and conserve life force energy so that patients do not die on their way for medical attention. These portable units are designed for basic wound repair on the go, and small scale organ regeneration. Medical Pod preparing to do laparoscopic surgery on a patient. 3D anatomical imaging scans being done to determine where laser surgery targets for wound repair will be performed. Limb restraints are being attached to the body so the patient does not move around during the surgery and liquid spray anesthetic is being administered so patient does not feel pain during the operation. Laser Laparoscopic surgery is in progress while patient is under medication stasis sedation. Resources: Click on titles to access information. Jared Rand Daily Global Guided Meditation – Everyday 3 p.m. EST – Number to call: 641-715-0857. Code: 303471. Playback number: 641-715-3579 (same code). Or online at Free Conference Call HD.com International telephone numbers are available (same code). Check home page on website for your international telephone number to call. The initial goal is to reach 8000 people meditating on a consistent basis. It is said that one person with focused intent can effect change for up to 1 million people! Posted in Michael Salla, Secret Space Program. Posted in Above Majestic, Corey Goode. “How did you get your human body?” I heard a voice, zealous to know. I tried to ascertain who I was talking to. It seemed to be a male entity about five feet six inches tall, asking me where I got my body. What kind of question was that? I did not think about where I got my physical frame from, I just have the one I got when I was born! The person looked ethereal, wispy, was not a gray alien or hybrid. Its figure, though human, was extra-corporeal. The year was about 2005, I was approximately twenty-seven and had no idea my third eye was opening in a most dramatic way. My God, I thought, am I developing schizophrenia? I did not answer the question because I did not know what to say. What I kept seeing, hearing and feeling caused me much emotional upheaval and through it all I had to keep my feet on terra firma – keep my job, pretend I did not hear and see into the spirit realms. I did not smoke marijuana or use ayahuasca to hon this experience. Universe was leading me to ascend whether I liked it or not….. I did not appreciate it. It is daytime and I am more asleep than awake, aware that I felt absolutely marvelous. Later on I thought that one of the reasons why I felt so good was because of the conversation I had with an angelic being as I slept. There was no sense of threat or fear, I knew I was protected. I giggled and laughed like a little girl as I spoke to my guardian angel. He asked me if I was sleeping. I stressed as continued to talk to the being. Apparently, this was the last part of the conversation because as I awoke, the angel was gone, leaving me with this snippet as total recall. Another time I am out in our local park, sitting on a felled log, set at the side of the path amongst shady tamana trees. Squirrels dart to and fro and the local birds are chirping. This morning I was a bit angry on account of a situation at home. As I sat there I spoke out how I felt into nature and into what I now know, is the Universe at large. Lo and behold, the birds chirped comments to my statements. “That person is weird, totally weird!” I heard them say. I chuckle quietly to myself as I realize I had an audience. I have heard not only these ones but several birds that hang around our yard as they feed on the yearly produce of our fruit trees. Some actually trilled that they would miss me when I move out on my own. This sparked feelings of tenderness and oneness with nature because I did not think that animals were so highly aware of humanities activities. I remember when our beloved dog ‘Woobie’ died we were depressed for weeks. She was a beautiful white Pompek mix who had been with us for almost fourteen years. Although the veterinarian told my brother she may get an operation to prolong her life, we realized it did not make sense, she was so weak she would have died anyway. As my brother sat and cried, spending whatever time he could with her while she could still hear us, she wagged her tail strongly to tell us it was okay to let go. The BIG SHOCK came afterwards. I was lying on my bed thinking of Woobie and suddenly, an angelic being dressed in robes appeared at the foot of the bed. Now, the angel did not look like Jesus Christ or anything, just let me make that clear. Interestingly enough in the crutch of his right hand was A DOG! From the shape and lower body fuzz it was impressed upon me that it was Woobie! breathing in and out with her tongue lolling out as it did in life. I got the sense that she was happy where she was and that I should be glad where I was too. From this I learned the vital truth that nothing that we love on this earth is really lost. The Universe or God Source, whatever you want to call it, has a record of every living thing that has a right to exist on this earth. I make this statement because I believe there is life here that Prime Source Creator did not sanction, and I believe these are the forms that do evil. However, seeing Woobie’s spirit gave me much encouragement that she was in very good hands and at peace. One night I am sleeping with my head facing the wall, just under the window. I turn towards the other side of my room which is occupied by a large wooden wardrobe. As my eyes open slightly I notice a wavy four footed, convex shaped silvery portal, smack dab where the façade of my draws should be. My mind says this cannot be true, that I must be dreaming in some way. However, something is trying to access my room – I actually hear the bouncing sound, like a force hitting back and forth against a barrier. Call it drudgery, but I turn my head back towards the left wall and window and return to sleep. My mind shut down, I was not willing to believe there could be something trying to come in…..and not through the door. Almost two weeks pass before I ask God Source what made the din that night. I heard. Good God, it was actually not a dream at all! Now I must say here, due to my Christian upbringing I heard the voice describe the presence as ‘Satan’ but it could have been any entity on the prowl for a kidnap victim. I firmly believe that a protective angelic presence prevented an attack. Whatever it was could not manifest in my room – it was pushed back out into the space time continuum, or ethers, by Divine hands. Another time, I am awakened from sleeping by the sound of some type of cosmic ray descending from above. The eerie frequency is like the low hum of a thousand wasps and as it makes contact with my ‘headspace’ I am aware that everything seems a hue of light grey – you know like the tuning of a television screen from peas and rice to brighter grey white. This time I feel cold fright because it was the noise that woke me up and I do not know what on earth is happening to me. “Mommie! Mommie! Mommie!” was the wail of a thirty-something-year-old woman calling desperately for her mother. I realize later I could not have been using my mouth because, again, it was paralyzed shut the entire time. My mother who sleeps in a room a few feet away, did not come to my aid. Thankfully, as I fully awake the noise ceases and with warmth returning to my body, I am able to sleep peacefully for the rest of the early morning. This time I did not see or hear angels but had the gnosis that everything was going to be fine. My mother said she heard nothing the next day when I spoke of the incident, which is odd because she claims to hear me talking from further distances than that. Knowing that I am not alone is important to me. I have family members and even friends that are having paranormal experiences as well. Many are Christians and have had their paradigms smashed by the gnosis that religion is false and offers no real protection. One friend spoke about astral traveling to connect with her eighty-seven-year-old mother, who has recently passed after battling cancer. She grieves, her mother died worrying about her because at forty-two, she is the last of five children and not particularly well liked by her older, richer, siblings. Though well educated, she is likewise unemployed in a shifting economy. I explain that astral traveling is a normal event for some people. “But I don’t practice astral traveling,” she says, assured that Christian ethics say it is wrong or demonic to do so. I expound that you do not have to practice astral traveling, it happens spontaneously, especially during sleep. This same friend has admitted to a very disturbing encounter one night in which she was choked by Lucifer himself. She said he mocked her continually, saying, “don’t you know me! Don’t you know me! I am Lucifer!” She is a dogmatic Christian and does not want to examine the religious abuse she is facing as proof that something is wrong with this religious paradigm. Her nights are full of witching hours in which she smells stuff burning and hears screams outside her house when nobody is out there. The thing is, it is inconceivable that anyone could be physically doing such acts so late at night. I ask the Universe to clear her programming and suggest that the “god” she is worshiping may not really be the One True God Source at all. I describe some of the things I went through and we speak of the dubious origins of Biblical texts. I ask her to study the evidence, that the god she serves was responsible for billions of deaths during the dark ages AND Transatlantic Slave Trade! She is still mad at ‘god’ for not healing her mother, while I wonder why she is not jubilant that God Source did release her mother from a life time of suffering and a diseased, elderly body. Though not a mystic or spiritualist, I had my third eye reopen after a series of traumatic events several years ago. 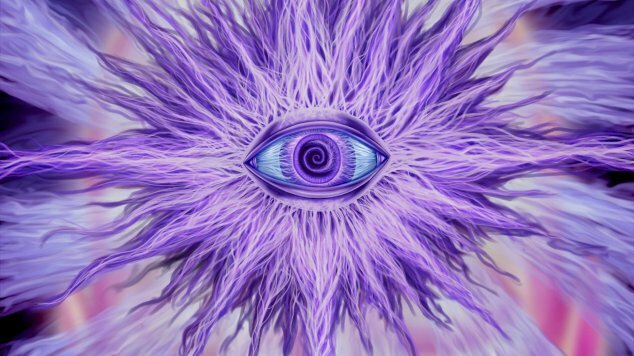 As a natural indigo and a member of a family with spiritual gifts, I would suggest to NEVER force the opening of the third eye with drugs or exercises. It will happen naturally, in God’s timing. Why? One would ask, is it not majestic to be clairaudient, clairvoyant and more spiritually aware? Yes indeed, however, one has to deal with the spiritual activity of entities that are not of Creator. Also, if a person is suffering with Dissociative Identity Disorder (DID), Post-Traumatic Stress Disorder (PTSD) or Satanic Ritual Abuse (SRA) there are further stresses. For, in these cases it is difficult to deal with the shadow self, or pesky energies connected to humanity, if unaware it is a part of oneself one is dealing with. In some cases professional psychological care may be necessary. The emotional upheaval may be very great and one has to practice good overall hygiene and do much inner work to comprehend more, move into the higher self and be a light to others. One has to learn what to share and whom to share it with. Seeing through the third eye is a natural gift but not all are ready for it. It may enhance life and aide the raising of earth’s vibration. However, it can detract from you if you cannot cope and start to think you are going crazy. I guess this is why even as we become more spiritually aware of the Law of Oneness and countless spiritual realms most of us have not yet seen the winning numbers of the lottery (I’m laughing here). Being more clairvoyant does not automatically make one a shaman or spiritual healer. Otherwise, I can assure you that God Source will always take care of you as you trust that you are Creator’s representative on this earth and co-creators of your own destiny. A hero lies in each of us and the timely, beautiful use of all God given spiritual tools can only enhance us when applied in the right way.